How do you make the Mercedes G-Class look more menacing? Add copious amounts of carbon fiber. If you want to make your Mercedes G-Class stand out from the crowd, Russian aftermarket tuner TopCar has given the SUV an extensive makeover with a new aerodynamic body kit that will be shown off at the 2019 Geneva Motor Show on March 5. Dubbed the "Inferno" package, the upgrade includes over 70 new components, all of which are made from carbon fiber and Kevlar. As a result, the lightweight material has been applied to just about every panel, from the front and rear bumpers, to the doors, fenders, side sills, hood, and roof. Even the rear-mounted spare wheel cover gets the carbon fiber treatment. 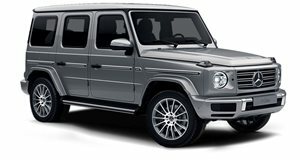 Elsewhere, TopCar has replaced the original grille with a new one that mimics the design of the modern G63, and also replaced the traditional three-spoked star badge with their own. The shark logo is also visible on different parts, including the front fender add-ons, side exhaust tips, rear wing and spare wheel cover. Rounding off the exterior changes are a couple of additional LED lights mounted on the roof, an eye-catching matte green paint finish, and new set of 22 or 23-inch alloy wheels. Inside, you can have genuine crocodile leather and gold. The Inferno that will be displayed at Geneva will also have a special leather upholstery mimicking the carbon weave. Pricing for the new G-Class Inferno body kit starts at $21,573, but if you want the full kit that adds the headlight protection cover, side roof panels, roof spoiler, additional LED lights, exhaust tips, and shark logos, it will cost you $30,278. If, however, you want the basic kit with visible carbon fiber, it will cost $27,980, whereas the full kit with visible carbon fiber and other carbon parts including the side mirror casings, will set you back $44,824. The costs don’t end there either. Installation and painting cost an extra $7,348 for the basic kit or $8,479 for the full kit. The engine hood in visible or primed carbon fiber costs another $8,479 and €6,350, respectively, and the 23-inch wheels will set you back another $8,705. Who ever said personalization came cheap?